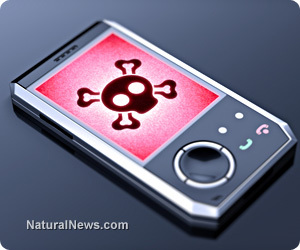 (NaturalNews) A new study raises concerns of a possible association between cell phone radiation exposure and breast cancer in young women. The research team, led by Dr. Lisa Bailey, a former president of the American Cancer Society's California Division and one of California's top breast surgeons, studied four young women - aged from 21 to 39 years old - with multifocal invasive breast cancer. The researchers observed that all the patients developed tumors in areas of their breasts next to where they carried their cell phones, often for up to 10 hours per day, for several years. None of the patients had a family history of breast cancer. They all tested negative for BRCA1 and BRCA2 - breast cancer genes linked to about one-half of breast cancer cases - and they had no other known breast cancer risks. Imaging of the young girls' breasts revealed a clustering of multiple tumor foci in the part of the breast directly under where their cell phones touched their body. Tiffany Frantz, one of the young girls involved in the study, said that she had no idea of the risks involved. "I put my cellphone right in my bra," said Miss Frantz in a TV interview that also won an Emmy. However, her mother Traci Frantz immediately made the connection right after Tiffany developed breast cancer at age 21. "We never took it seriously until after she was diagnosed." Her tumors were exactly where her cellphone had been kept in her bra for about six years. No one ever told us that this was a very bad idea." said Traci Frantz. Surgeons had to remove Tiffany's left breast. Her family had no genetic or other risk factors. Cell phones emit a form of electromagnetic field (EMF) called radio frequency radiation. This radiation exposure has previously been linked to brain tumors, cancer, cardiovascular disease, depression and other serious illnesses. Studies show that other EMF exposures from similar, supposedly harmless, everyday appliances and devices can also be dangerous. The recently published "BioInitiative Report 2012" concluded, "there is sufficient evidence from in vitro and animal studies, from human biomarker studies, from occupational and light-at-night studies, and a single longitudinal study with appropriate collection of urine samples to conclude that high MF (magnetic field) exposure may be a risk factor for breast cancer." The report's authors went on to say that "there is rather strong evidence from case-control studies that longterm, high occupational exposure (over 10 milliGauss) to ELF (Extremely low frequency) magnetic fields is a risk factor for breast cancer." Currently, the main international guidance comes from the International Commission on Non-Ionizing Radiation Protection. These guidelines offered no protection for Traci Frantz and others who unknowingly put their health at risk by carrying their cell phone in close proximity to their body. Nor do these guidelines protect individuals from high magnetic field exposures in the home and workplace. The existing exposure limit for magnetic fields is 904 mG in the US - some 90 times higher than the levels at which independent studies have observed adverse biological effects! Even cell phone manufacturers suggest that users keep their cell phone at least one-half inch or more away from any body part. But these recommendations, lost in the small print in user manuals, are not heeded. Current safety limits can no longer be said to be protective of public health, and they should be replaced. Lloyd Burrell is the founder of http://www.electricsense.com/. Since falling prey to a violent reaction to his cell phone in 2002 Lloyd has spent more than 10 years researching the effects of electromagnetic fields (EMFs) on health. He is the author of an eBook entitled "How To Beat Electrical Sensitivity" which offers a solution to the growing number of people whose health is being compromised by exposure to wireless and similar technologies. You can download his free EMF Health Report and subscribe to his newsletter by visiting his website ElectricSense.com. You can also follow him on Facebook , Twitter, Youtube and Google+.